Star PowerColt’s movement speed is increased by a pair of slick new boots. Colt rattles off a massive burst of bullets that shoot extra far and destroy cover. High damage output. Lacks utilities. Excellent in long ranged fights. No crowd control, escape or gap closing abilities. Super can shoot through and destroy walls. Can be one-shot by strong Brawlers. Please note that this guide is a bit obsolete! Colt is a supreme attacker and somewhat of a sniper. He has a pretty long attack range but rather slim width. If in the right hands, he is one of the deadliest character in the game. In a 3v3 situation, it is best if he stayed back and sniped the damage dealer of the other team. Dude to his attack being fast and deadly, this shouldn’t be a problem. Then stay back and help your team defeat the upfront attackers. If all three of his attack bursts hit an opponent then even El Primo will be defeated. Mind the If. It is pretty hard to connect all of the bullets on an opponent. 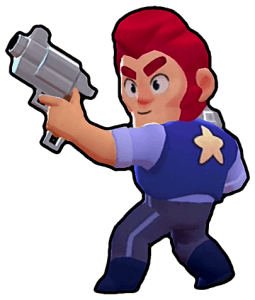 Like most of the brawlers, Colt also has 600 health so he is pretty squishy. But this won’t likely be a problem seeing how quickly he can take out an opponent. His most deadly weapons. He fires in a straight line dealing massive damage, firing 6 bullets, dealing 80 damage each bullet. His attack speed is moderately fast so sometimes you can to miss the shots. He requires to shoot twice to take out any brawler and can take out even El Primo with three bursts. While he may seem OP, but the truth is, it is pretty hard to get all shots on the opponent. Most of the time you will only get 2 or 3 bullets on the opponent using him. So this balances him out pretty well. 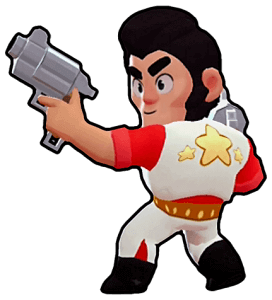 Colt fires a mountain of bullets which are wider than than his normal bullets and they break blocks making it easier to kill hiding Dynamike and Shelly. With Colt being a long range character and Shelly being a short range, I’d say this is a pretty easy matchup. Keep your distance and fire during precise moments. Just watch out for her super. A mirror matchup. The one which has the better understanding of Colt will obviously win. Keep playing mind game on the opponent. Go offscreen from the left and then attack from the right. Make sure that you have ammo in case the opponent charges you (which will most likely result in their death). Brock is at a disadvantage because even though both of the brawlers are long range, Colt’s attack has a much higher chance of hitting the opponent. In addition, Colt also has a much lower ammo recharge time than Brock. Charge Brock and keep weaving while pummeling him down. His primary attack and super shine the most in closed spaces. So don’t engage him there. Even though her attack and super are pretty deadly, they are just so slow and easy to avoid just keep weaving and shooting and she’ll be dead in no time. Do NOT let her get close. Her attack deals pretty high damage so she’ll constantly chase after you. It’s best to run and shoot back. Her super spawns a bear which is easy to take out but ultimate diverts your attention away from Nita. So focus Nita and keep running. He is a pretty tough nut to crack because his strategy is being sneaky and throwing bombs so that you can’t get close to him. The trick is to keep run after him and then back up once you see him throwing dynamite. His super is the same thing but is bigger, deals more damage and knocks your back. Play smart and he’ll be defeated in no time. This has been repeated in every guide but STAY AWAY FROM HIM. Once he get close enough to engage you, it’s pretty much goodnight. Stay way from him and you’ll be fine. Watch out for his super though. If it connects it is a guaranteed death. Like El, keep away. He has a small range but is pretty strong and hefty. Keep as much distance from him as possible and keep attacking. If he uses his super, step out of his way and keep shooting at him. This way you’ll finish him for good. He is pretty much like you except he sacrificed health for bouncing bullets. In a 1v1 situation, you will have to be aware of your surroundings and keep him in your sight. Remember, he can attack you even if you can’t attack him. So weave and keep him in your sight. He is really just like Dynamike but with more area denial. Just stay clear of his attacks and don’t get yourself cornered. Instead, charge and make the opponent pay for choosing Barley. You would not believe the amount of times I have died because of Poco. Either because he healed his nearly dead teammates or because he keeps running away and fires back with his stupidly massive attack radius. Stay out of his attack radius and you should be fine. Just make sure you defeat him before he heals. One of the most challenging matchups. He can just gets shots on you and then run away easily, all while you don’t even get a single shot on him. I’ve found it much easier to defeat Mortis while he is trying to run away than while he is attacking you. So tank his attacks and while he is running away unleash a bullet hell on him. When you see him using his super, RUN. He is a challenging foe. His attacks not only deal lots of damage but they also splash, meaning it’s very hard to hide from him. So the best mode of attack is to get him to an open space then weave and dodge him until you defeat him. If you see him activating his super, get out the way quickly. She is almost the same as Brock. Firing 1 shot at the time from far away dealing huge damage. 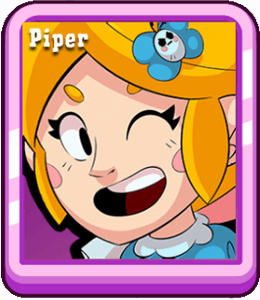 Piper however lacks AOE so if you can safely hide near a wall. Since she deals more damage the farther she is away from you, she will likely run as far as the spawn to get maximum damage. Use this to your advantage. Dodge and weave to not get hit and get close to her to finish her off. Not too close though. She will likely just use her super to jump out of your way and finish you off. He is pretty strong so I would not recommend just standing there and attacking him. Run in zig zags and defeat him. Don’t get caught in his super though. This will most likely result in death. His poison daggers are pretty strong. They stop you from healing and do continuous damage. Stay as far away from him as possible because in doing so it’ll be easier to avoid his attacks and gives you more time to avoid his super. All three of his stats are pretty important to upgrade. But some are much more likely to be helpful than the others. Colt is pretty squishy with only 600 health. If you want to survive those 3v3 battle and want to clutch your way to victory. It is more beneficial to upgrade his health before others. Next is his attack. With 480 damage per burst he is pretty strong. But once you start going against people whose health is much higher than before. You’ll start understanding why you should upgrade attack. Finally, the Super. For much of the game your super will take out any opponent no matter how much they have upgraded your health. So it really doesn’t seem logical to upgrade the super in the early game. This is my first guide on BSU and I wanted to cover my favorite brawler for this occasion. Thank you guys for reading this and I hope you have learned how to play Colt in a professional manner. If I have stated anything wrong or missed something, please state it in the comment section. 1st, Will how long did this take?? ?